A - Also known as PZ - the distance from the spindle hole to the centre of the key hole. This measurement is crucial. B - Distance between the centre of the top screw and the centre of the bottom screw. 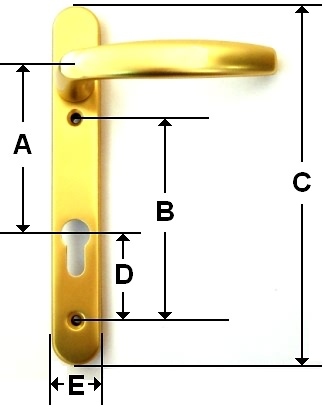 Please visit our 'Find It' page if there is a particular door handle size, style, make, etc... that your looking for and we will source it for you. ASEC Replacement Spring CassetteAsec Spring Cassette to suit un-sprung or lightly sprung UPVC door h..
Digital Lock With Optional Holdback AS2300 SeriesThis Asec mechanical digital door lock from the AS2.. Door Handle Spindles - 7mmReplacement door handle spindles 7mm. Will fit 99% of all door handles.(Th.. Door Handle Spindles - 8mmReplacement door handle spindles 8mm. Will fit 99% of all door handles.(Th.. An ideal replacement spring mechanism for those door handles that sag or fail to return to their res..
A pair of half spindles used with the appropriate locking mechanism where split spindle functionalit..
Hueck Hartmann lockable window handle for Hueck tilt & turn window systems.The handle is fitted ..
1 x Metal Spindle Sleeve Adaptor (7mm to 8mm)A simple square metal sleeve slides over a 7mm spindle ..